The United States began its quest to put man in space after the Soviet Union put the first man-made object - Sputnik - into earth orbit. Project Mercury was the first phase of that effort with the first two manned flights using the available Redstone stack which could only achieve suborbital flight. The third and subsequent flights used the Atlas stack which had the power to push the Mercury spacecraft into orbit, but had a less than stellar reliability record. The Mercury spacecraft was a lightweight, one-person capsule that carried a strap-on retro pack on its heat shield and an escape tower atop the craft for the early stages of launch should the booster stack fail during launch. The size of the capsule and booster were impressively smaller than their Soviet equivalents because of the combination of low atmospheric pressure and pure oxygen inside the US spacecraft versus a higher pressure/normal mix atmosphere inside the Soviet spacecraft resulting in a diving bell design of their craft and a much larger booster to get the extra weight off the ground. 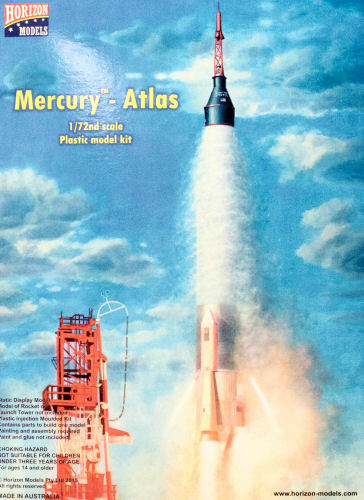 Horizon Models released their first kit several months ago with their comprehensive Mercury spacecraft kit which was actually two complete kits in one box with options to render virtually any of the spacecraft from the unmanned test vehicles to the seven manned vehicles. Here is their second release which is as comprehensive as their first kit. In this release, we have the same Mercury kit released previously and three new sprue trees representing the Atlas D.
The kit is simple and yet thorough enough to cover the parts and markings needed for the Big Joe, MA-1 to MA-4, and MA-5 to MA-9 configurations including marking differences unique to each mission. The decals are printed by Microscale and include the specific Atlas airframe numbers for each of the specific flights. If you look at the Atlas sprues, you'll note that there hints of another kit to come which will represent the Altas ICBM with Mark 2, 3, or 4 reentry vehicles. Look for this and other exciting new subjects coming from Horizon. This kit is available directly from the manufacturer: http://www.horizon-models.com/1-72-mercury-atlas.